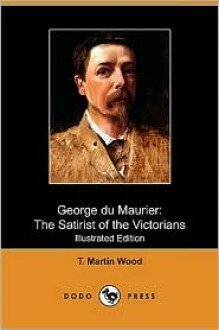 George Louis Palmella Busson du Maurier (1834-1896) was a French-born British author and cartoonist. He studied art in Paris, and moved to Antwerp, Belgium, where he lost vision in his left eye. He became a member of the staff of the satirical magazine Punch in 1865, drawing two cartoons a week. Owing to his deteriorating eyesight, du Maurier reduced his involvement with Punch in 1891 and settled in Hampstead, where he wrote three novels (the last was published posthumously). His second novel Trilby, published in 1894 fits into the gothic horror genre which was undergoing a revival during the fin de siecle. The story of the poor artist's model Trilby O'Ferrall, transformed into a diva under the spell of the evil musical genius Svengali, created a sensation. A notable cartoon he made was a cartoon of a television/videophone conversation in 1879, the telephonoscope. His other works include: Peter Ibbetson (1891), The Martian (1896) and Social Pictorial Satire (1898).